We appreciate your interest in the Junior League of St. Louis (JLSL), and welcome you to join us! 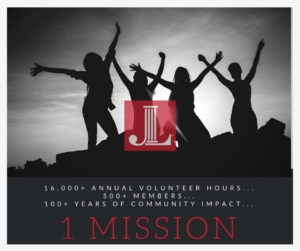 For 104 years, the JLSL has been both a powerful organization of trained women volunteers and a vital part of the St. Louis community. Membership in Junior League of St. Louis is open to all women who demonstrate an interest in and commitment to voluntarism. The JLSL reaches out to women of all races, religions and national origins. The JLSL has nearly 600 members and, as a member of the Association of Junior Leagues International, is one of nearly 300 Junior League chapters in the U.S., Canada, Mexico and the United Kingdom. Are you looking for a way to meet new friends, give back to the community or grow as a leader? Junior League of St. Louis (JLSL) might be a great fit for you! Our Active members are business owners and stay-at-home moms, high-heel wearers and running shoe aficionados, recent college grads and retirees. Each one of these more than 500 women joined JLSL for her own reasons, but we all stay because we believe that we can make an impact on our world. Our members are a diverse group of women, looking to make a difference in their community through volunteer projects, fundraising events, and social activities that provide hands-on experience building leadership skills and friendships. JLSL welcomes new members (we call them Provisionals) once a year. We will hold several events in late spring and summer to introduce you to what we do and explain how to join Junior League. The deadline to join the 2018-19 Provisional Class was July 31, 2018. You’re willing to tailor your volunteer experience to meet your own needs and schedule. The Junior League Provisional year runs like a school year, so new members begin their Provisional year in August. Of course! If you are unable to attend one of our events, you can complete the Provisional Enrollment Form and Contract to get your JLSL journey started! Just a few things. You will need to complete a Provisional Enrollment Form and Contract. All new Provisional members must also pay a registration fee to help cover training materials. If you have submitted your Provisional Enrollment Form and Contract along with your registration fee by July 31, you’re in! You’ll be notified of the date of your first Provisional class meeting, usually mid-August. Together, you’ll participate in a sampling of the many activities Junior League offers, such as Community Impact volunteer projects, training workshops, fundraising events, meetings and social activities.